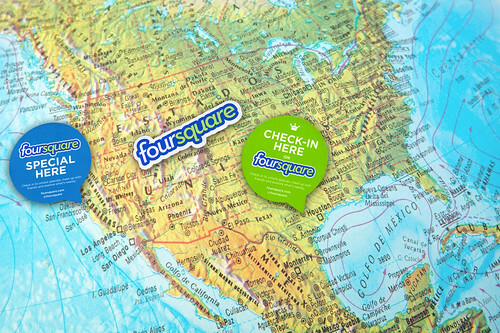 Foursquare is a location-based social network that enables users to check in at venues. Currently boasting over 20 million users – a million of which are businesses – it’s the most up-and-coming and innovative social media site to exert its presence on the web. Through its unique combination of engaging people with fun social media alongside viral messaging and enticing incentives, it’s the ideal tool for increasing business traffic, raising brand awareness, generating engagement, and marketing your company. The concept is simple: users check in at venues via a mobile website, text messaging or a device-specific application. They’re then rewarded points and, in some circumstances, badges to acknowledge certain activities and on-going interaction. Foursquare is unparalleled in its scope for connecting people to places. This means it can pack a particularly herculean punch when it comes to promoting your next meeting or conference. Foursquare has two badges that are rewarded to users who check in, and existing badges can also be used to increase awareness and drive attendance to a conference. For example, if fifty people check in, a Swarm Badge is unlocked, if 250 all check in the same venue and time period, a Super Swam Badge is unlocked. When promoting events where there’s the possibility of obtaining a badge, people will generally promote to all their peers which, in turn, encourages more people to check in to secure the badge award. When you enter all the information about your conference on Foursquare (not forgetting the Twitter name of your event), you can create different venues if your conference is hosting a series of events. For example, you can create a venue for the opening night reception and another for the breakfast award ceremony, or whatever categories the venues fall in to. The Shout and Ping functions let you send a message en masse to other users and friends. It’s a great tool that allows you to make announcements, all of which can be received through mobile applications. There’s also a function that enables you to post up instructions or tips on the actual venue’s page. As manager, venue owner, or the agent promoting the event and conference venue, you’re able to claim the ownership, the result of which allows you to view and utilize the valuable and robust back-end analytic package that’s associated with each site. For example, you can find out useful information such as who’s checked in and the frequency they’ve done so, their Twitter username (if it’s in the public domain), whether they’re male or female, along with any suggestions or comments they’ve made about the site. You can always add ideas, hints and tips to your events. For example, you might want to say, ‘Get 4 friends on Twitter to mention #EVENTNAME and tag you and you will receive entry to our VIP reception.’ Everyone love some VIP pampering, so that’s guaranteed to generate a buzz. There’s no such thing as too much publicity. Make sure your attendees know how to check into your events or conference on Foursquare when they arrive; this can be included when you confirm their registration, in follow-up emails, and on social networks they use, such as Facebook, Linked In and Twitter. And if you’re concerned they might not know how to use the service, you’ve got the fantastic option of creating a sort video, demonstrating how to use Foursquare, and posting a link for your attendees. Again, it’s a great way of letting them know they receive prizes, upgrades, and VIP entry, or even becoming the ‘mayor’ of the event (the person who checks into the venue the most times). When the conference is over, make sure you go back to your Foursquare page to see how many people checked in, if any hints or tips were left on the venue page, or if anyone took advantage of the check in promotion. In a nutshell then, the key factors and feedback that could help shape and influence the social media marketing for your next meeting or conference – what worked, what didn’t, and possible ways you could improve next time. When it comes to social media platforms there’s more out there than just Twitter and Facebook. The constantly shifting and organic nature of social media necessitates every business has its finger on the communication and marketing pulse. An undeniably instrumental tool that not only increases awareness of your meetings and conferences, but also gives the attendees the power to market the event for you. Has your business had any experience of using Foursquare, and what do you think of it? Share your thoughts and comments below.